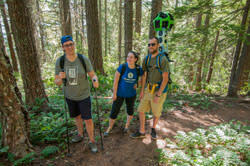 Join Travel Lane County&apos;s staff as they trek across the Eugene, Cascades & Coast region on the "Google Trekker" project. Similar to Google&apos;s "street view," this technology makes pedestrian trails accessible to viewers around the world. 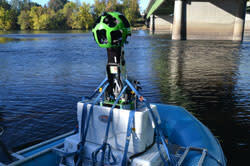 The Google Trekker is a backpack system crowned by rotating cameras capturing 360-degree views. The images are stitched together creating a visually immersive experience. Mapping the terrain with a "trail view" of the region&apos;s many natural wonders required endurance and ingenuity. Watch our staff carry the camera to the top of towering sand dunes, across log bridges and to the foot of roaring waterfalls. When backpacking wasn&apos;t an option, they strapped the Google Trekker camera to boats, horses and bicycles - just so that you could experience the unique beauty found here in Oregon. Hike to amazing waterfalls and float the famous McKenzie River on our Google Trekker expedition into Oregon&apos;s Cascade Mountains. 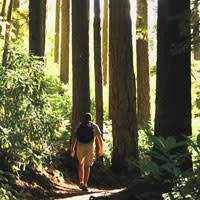 From wheelchair accessible paths and viewing platforms to challenging trail descents and river crossings, the "trail view" transports you into the magic of old growth forests and powerful waterways. 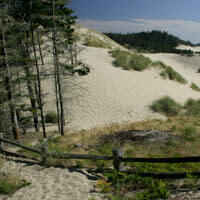 Trek up and over the Oregon Coast Sand Dunes and out onto Oregon&apos;s beaches with a phenomenal Google Trekker experience. Climb the accessible paths to a 100-year old lighthouse and delve into delightful coastal forests. Discover the wild beauty of the coastline and unexpected terrain. Even the University of Oregon Duck gets into the action, trekking the track around Historic Hayward Field in Eugene. 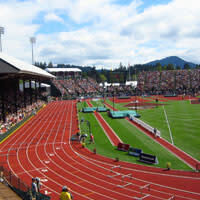 View the stadium from an athlete&apos;s perspective, looping around the lanes. Next cruise the bike paths of Cottage Grove, an All America City known for its many historic covered bridges. Roll through the bridges on an amazing journey back in time.